Hmm, it this a Cupola? I think of Cupola as sitting on roof and being vents for the attic, actually there is probably a better name for this that is more accurate. It is not a cupola. 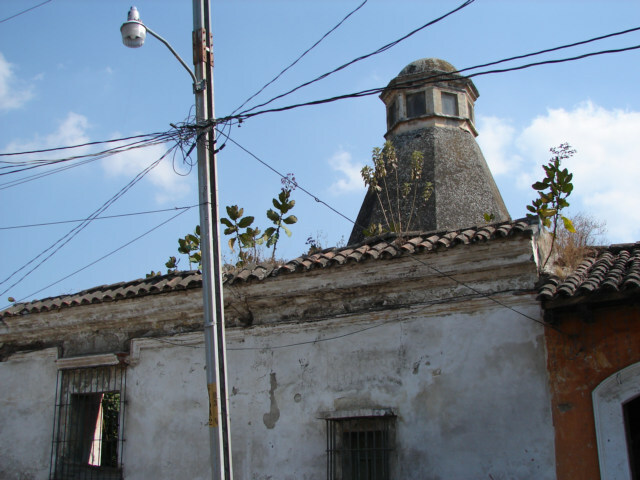 cu�po�la a dome, especially a small dome on a circular or polygonal base crowning a roof or turret. I am confused on what a Cupola is actually and what is the reason for a Cupola? However�. Culture, this is an identifier I would suppose of the Guatemala Culture. The better I become with speaking Spanish, the more sure I am that you need to speak the language of a culture you are studying to attempt to understand. Below this is a kitchen, or Cocina in Spanish, I stopped a gentleman in the street and inquired. I have not seen these in many of the Latino countries. How this probably works is there is a wood fire and they cook inside, this channels the smoke out the top. They have put glass over the opening on most that exist presently in Antigua. There are some real pretty painted ones; however, this old decrepit one to me is an identifier of a more true culture. New stuff is normally a copy of many things and does not function well. Of course, I could be totally wrong, and often I am, this is a curious venture of the brain, trying to understand cultures of the planet.